1930 Bugatti Molsheim - Letter with Credit Note. 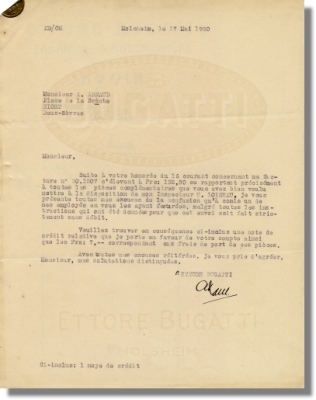 This is an original 1930 Ettore Bugatti Molsheim letter with credit note dated May 27, 1930. 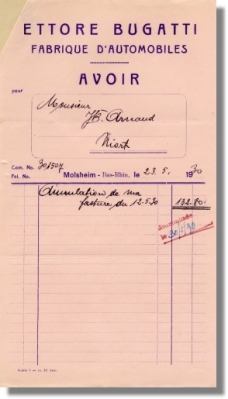 The letter elaborates on the return of a number of parts and consequently a credit note (see image 2) for a total of 132.80 Francs. 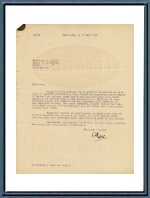 The letter comes on paper with the large Bugatti "Radiator shield" logo watermarked across the top of the page and the "Ettore Bugatti" script logo watermarked across the bottom. The letter is typewritten and is "signed" Ettore Bugatti" but the actual signature is from one of the secretaries.